Being one of the most beautiful cities in Europe, Ghent is sure to amaze any visitor with not only its fine architecture but also fantastic parks and nature resort. We can count Kouter, Citadel Park, the Botanical Garden of Ghent University, Muinkpark, Leeuwenhof among its fascinating destinations. 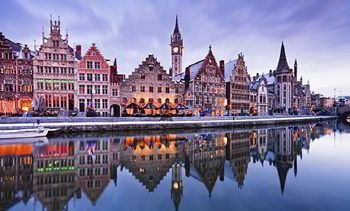 Ghent is also the home of museums and medieval castles. You will have to make sure your entire group visits Gravensteen Castle, Museum voor Schone Kunsten, The House of Alijn, Frank Steyaert Gallery, UGhent Observatory Amrand Pien and many others. There are multiple car rental services operating in Europe and certainly, all of them claim to provide the best services in the industry. 8Rental is among those, which stand for what they claim. Therefore, choosing 8Rental as your passenger transportation service in Ghent, you are definitely making the right decision. We are one of the most competent and experienced rental services and have managed to gain the approval of hundreds of thousands of customers. Getting a quote and completing it, you are ensuring yourself with a reliable and comfortable means of transportation with a driver in Ghent! 8Rental always strives to exceed its client's expectations, no matter how extraordinary they might be. Just for this reason, we are encouraging you to contact our CS operators to find answers to all your questions and rent a bus with a driver in Ghent on a beneficial basis. You can also mention your special requirements just in the quote you get and complete to book a vehicle from 8Rental. 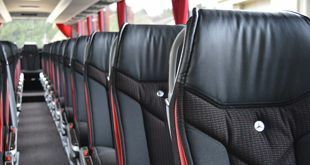 So, instead of hesitating or thinking over and over about hiring a coach, you'd better read this brief yet an informative article about booking a bus in Europe from 8Rental and then hire a coach right away! Mercedes Tourismo is a grandiose coach model that guarantees comfortable and safe driving for almost sixty-five people! Truly, if necessary, this bus is huge, yet manages to drive along Ghent's roads quickly and agilely. 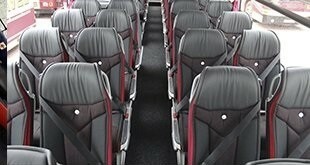 It is equipped with such important specs as comfy seats in aircraft style, air conditioning, central heating, a toilet, a fridge, a filtering coffee machine, an advanced audio system with CD and DVD reading capability, air suspension, etc. However, if you need some extra features in the vehicle such as a TV, a minibar, etc., feel free to inform our CS operators. They will gladly organize everything so that you stay absolutely satisfied with what you get. 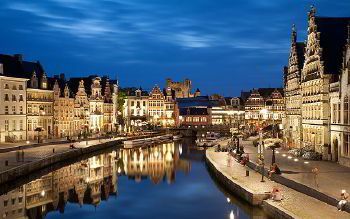 To hire this chauffeured coach in Ghent all that you need is getting a quote and filling it out. When booking a huge bus for a large group of people you get responsible for their safe transportation. 8Rental wants to relieve you from that responsibility and get in charge of the safe driving of all of you instead. Our drivers are real experts of their work and they guarantee to drive you wherever you need in Ghent in complete safety. Besides having valid driving licenses, these drivers have years of expertise in the field and a strong determination to satisfy all clients who are relying on them. They are skillful and responsible. By the way, we have drivers speaking different languages including German, Dutch, English, French, Italian, Russian, etc. Hence, depending on your mother tongue, book a respective driver. Be sure, you will not regret trusting 8Rental's chauffeurs! Be certain you won't ever get any other service offering a better condition of hiring a bus in Ghent than the one 8rental is offering! Besides providing with a grandiose vehicle and a professional driver, 8Rental also has some freebies to surprise you pleasantly. The fuel, the insurance, as well as all the taxes and fees are all included in the offer.